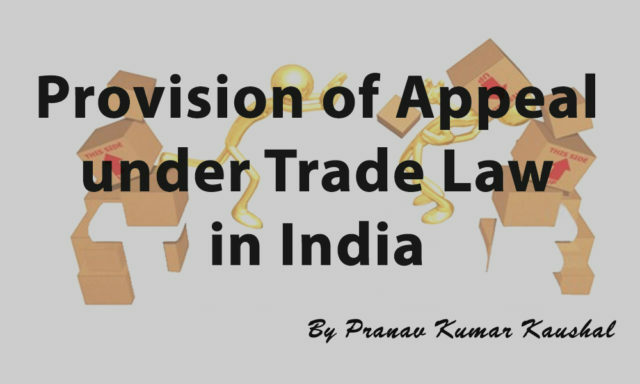 The provision of Appeal under the Trade law is incorporated with the machinery termed as Intellectual Property Appellate Board, which was constituted by the Indian Government on 15th September 2003. The Intellectual Property Appellate Board is competent to hear and adjudicate appeals against the decision of Registrar under the Indian Trademark Act, 1999 and Indian Geographical Indications of Goods (Registration and Protection Act), 1999. Since, 2nd April 2007, the Intellectual Property Appellate Board has also been authorized to hear and adjudicate the appeals from the decision, order, made by a controller within their respective acts. Therefore all pending appeals before the Indian Courts were transferred to Intellectual Property Appellate Board. The headquarters of the Intellectual Property Appellate Board is located in Chennai, but the Intellectual Property Appellate Board has its sitting in Chennai, Kolkata, and Ahmedabad. An appeal can be made to the Intellectual Property Appellate Board against the decision of controller or central government in matters related to the refusal of the application, orders related to divisional application, orders relating to specification of date o application, orders related to anticipation, orders and decisions in case of infringement, orders regarding the substitution, revocation, correction of clerical errors etc can be made to the Intellectual Property Appellate Board. Each bench of Intellectual Property Appellate Board shall consist of the judicial member and technical members and qualification for being the Judicial and technical member may be as prescribed by the Central government in such behalf. Appeals from the decisions and orders of the Controller shall be made with the period of three months from the date of decision, orders, and directions made by the authorities as prescribed under the act with prescribed fees. An extension can be made available for filling the appeal by way of a Condonation of Delay Petition. The pre-requisite for such petition must be having valid reasons for the delay, along with prescribed official fees. The Appellate Board can receive, hear and dispose of all the appeals made from any order, decision and direction from the controller with respect to the revocation, rectification, and counterclaim in a suit for the infringement. The appellate board has the authority to proceed with the matter either de novo or from the stage at which was it was transferred on appeal. The Appellate Board has the powers to make rules consistent with the act pertaining to the conduct of the proceedings. Every appeal shall be made in the prescribed format and with appropriate fees as per the provision of the Intellectual Property Appellate Board Procedure Rules 2003 within three months from the order of the controller or central government.